Mahwah was in court this week having settlement talks with lawyers from the NJ Attorney General’s office. The township council was charged with discrimination after passing an ordinance aimed at banning Hassidim from their parks & trying to prevent the final segment of the Rockland Eruv from running through a corner of the township. These actions have cost Mahwah dearly, both monetarily and in terms of reputation. Bordering Upper Saddle River has also rung up high legal costs, while nearby Montvale emerged relatively unscathed overall. The three towns were in communication from the beginning, and spent time analyzing each other’s legal filings and developments. All three towns received subpoenas from the NJ Attorney General’s office around the same time, but in the end only Mahwah was sued by the State. Special counsel worked on auxiliary items such as reviewing OPRA requests and advising on police reports (a number involving Facebook Group “Citizens for Better Upper Saddle River” founder, Erik Friis). Mahwah unleashed its actions amidst an outpouring of hate and bigotry, egged on by their council. To defend against the two federal court cases (see here and here) that it faced as a result, Mahwah hired a bevy of law firms with random specialties. When including the $10,000 paid by Mahwah to cover the eruv association’s legal costs in a settlement, this is a total of $221,395.37 spent on litigation (to date) due to the town’s actions. Note that this number will increase as the Attorney General lawsuit progresses, and may include a penalty paid if the case is lost or settled. Mahwah’s request to file for dismissal of the suit was denied this week and the case is currently set for fact discovery which is to be completed by September 30th, 2018. Bruce Rosen, hired as lead attorney, is the only person to ever have any measure of success against an eruv; his legal arguments won the first round in 2001 in favor of the town of Tenafly before the ruling was reversed on appeal. His firm billed USR a whopping $402,521.48 (invoice), which included writing extensive legal briefs and a few appearances in court. Joining as adviser was Marci Hamilton, professor of constitutional law, and the lawyer who had the predecessor to RLUIPA declared unconstitutional. She billed only $5000 (invoice) for her involvement, although she tried to cash in on the esteem of her University. 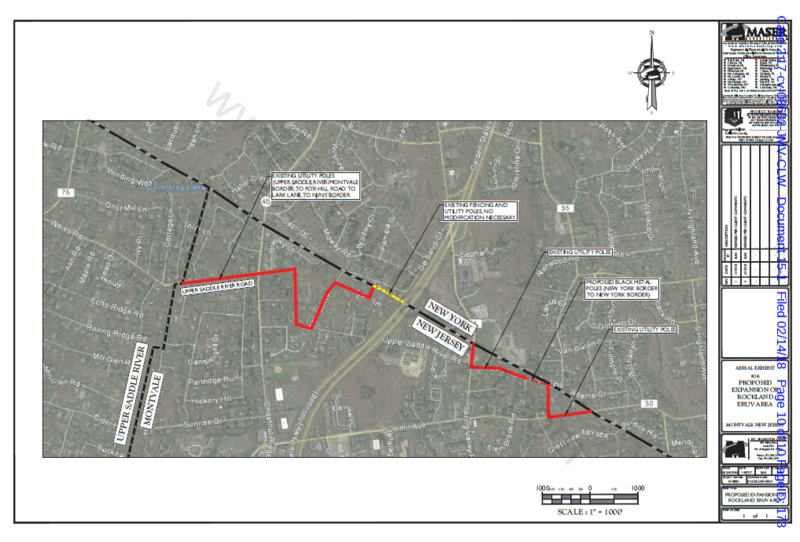 After a disastrous preliminary hearing, Upper Saddle River settled, agreeing to allow the eruv to remain if moved as close to the NY border as possible, and pay $75,000 of the eruv associations legal costs. This brings their total costs to $580,480.28. Among the three municipalities, Montvale took a different path. The town administration signaled their willingness to settle their case first, with Mayor Mike Ghassali holding a two hour town hall where he said they will “accommodate their neighbors to the north”. The town used only their usual township attorneys, Boggia and Boggia, who billed just $8,148 (invoice) to negotiate an agreement.Combined with the $10,000 settlement they paid, they spent only a fraction of what the other towns did at a total of $18,148. Montvale’s settlement was essentially the same terms, if not better, then the others, but they paid far less and really did not end up caught up in the controversy at all. Today, the eruv actions in Mahwah and Montvale came to a close1. While both towns have come to the same inevitable conclusion, that an eruv will stay on the telephone poles through a small area of the municipalities, the actions of their elected representatives demonstrate the role effective leadership can play during times of change. Montvale Mayor, Mike Ghassali shows photos of potential lechis to residents and displays a map of potential routes for the eruv. Below is a photo of Mayor Mike Ghassali at the Town Council meeting which took place on January 31st. He spoke to the residents about the reason for the eruv’s path into NJ. He talked about home values, stressing the fact that they didn’t change in towns with an eruv. He went over the options the Borough was discussing with the Eruv Association. He indicated the homes potentially affected under each plan. He spoke about the experiences of Tenafly over the course of their eruv litigation. He showed maps of the potential paths for the eruv, as well as photos of possible lechis under consideration. He provided answers to questions. 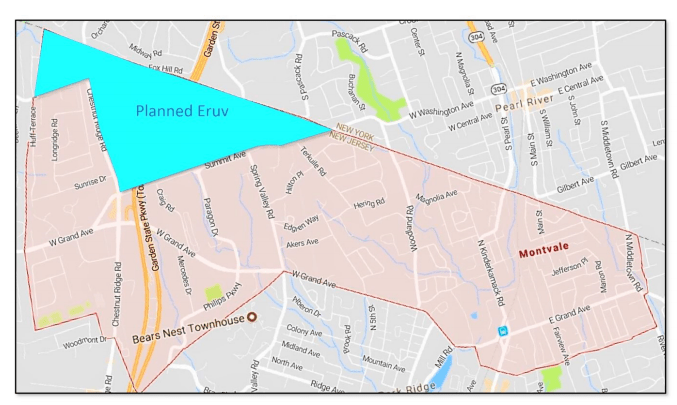 At the start of the eruv controversy in Upper Saddle River, the council and Mayor brought Bruce Rosen (the attorney that handled the Tenafly Eruv action for the Township of Tenafly) to speak at the public meeting on August 3rd. You can hear him speak in the clip below. He stated that “courts are hostile to towns that try to stop eruvs”. He spoke about the eruv case in the Hamptons. He talked about the holdings of the Federal Courts and he answered questions from residents. Residents asked about whether they can put crucifixes on poles. They asked about the non-resident status of the eruv association. He answered the questions about standing and provided legal advice to the municipality in public. I really encourage you to watch the clip below. The actions taken by Montvale and USR were not novel. When the Hamptons Eruv Litigation took place, the Township tried to be upfront with their residents, as well. You can see thousands of pages of court documents including legal declarations here on the West Hampton Beach web site. Compare the behavior of Montvale, USR and Westhampton with that of Mahwah. Starting in July, the Council had kept information from residents. Despite repeated requests from residents at meetings, the council refused to provide information about its actions. Why weren’t summonses issued? Why weren’t ordinances enforced? Some of these answers became readily apparent through Open Public Records Act request, although the council’s president, Mr. Hermansen complained about their use at council meetings. Votes to appropriate money for attorneys were tabled and postponed, eventually to be held at 10am on a weekday. The Council, at the direction of Robert Hermansen spent hours in closed session while the public waited, desperate for information. When the council returned, they delayed and offered postponements, pushing meetings to the next day. It was a veritable war of attrition as the council waited for interest to wane before moving on. Eventually, a Town Hall was announced by Robert Hermansen and information, at long last, would be offered to the public. On the day of the meeting, the event was cancelled. The reason offered, after several days was that the Township was still enmeshed in litigation. This makes little sense, as it was in the same litigation when the meeting was announced. Meanwhile, the eruv litigation has finally come to an end. The case is closed. The parties are done in the courtroom. All Mahwah residents should agree on one thing, they have not been well represented. They have been misled, deceived, bullied, and eventually, just had information kept from them. Now, the case is over and the people of Mahwah deserve answers. And they deserve the ability to ask question, without being interrupted. Mahwah needs adults at the helm. UPDATE: On Feb. 15th, Judge Vazquez entered a retention order and closed the case. Normally, after a case is over, a new action may be necessary to enforce the terms of the agreement. This order lets the court retain jurisdiction so that if there is a need to enforce the settlement, a letter can be filed asking the case to be re-opened. UPDATE 2: Information and paragraph numbers in the settlement were added for ease of reading. In settlement papers filed with the court today, Montvale has given up on their six month campaign aimed at prohibiting an eruv in the Borough. The agreement contains an Exhibit A showing the agreed upon path of the Eruv through the Borough. In a vote yesterday, the Montvale Council agreed to settle claims brought by the Bergen Rockland Eruv Association against the Municipality for threatening to prohibit an eruv erected in a section of the Borough. Within 30 days, the Borough will pay the law firm of Weil, Gotshal & Manges, LLP $10,000 to cover some legal costs, pursuant to paragraph 20 of the agreement. The Eruv Association will attempt to use black narrow strips or black or brown color for the pvc piping on the poles (called lechis) unless required to use another color by the Utility companies. Aside from the $10,000 payment, each party will bear their own litigation costs which may have been hundreds of thousands of dollars had this gone further. Montvale will secure all consents necessary to allow the eruv to be constructed, and checked on a weekly bases in public areas (paragraph 9). Montvale will grant any applications for new posts if necessary to effectuate the plans in the map (paragraph 9). Montvale will make sure the BREA has consent to enter private properties to check on the Eruv at least three times per year, although inspections will be conducted from roadways and publicly accessible areas whenever possible. (paragraph 10). If Montvale and the Eruv Association can’t get a valid eruv up in 45 days based on the map provided in exh. A, the Eruv Association can put up the eruv according to the plan outlined in the original complaint (paragraph 12). If Montvale ever moves to underground electric cabling, they agree to work in good faith to reestablish the eruv (paragraph 13). No public funds will go towards the Eruv (paragraph 16). Plaintiffs will not initiate any new litigation against Montvale for at least 2 years as long as they abide by the agreement (paragraph 19). Plaintiffs agree not to file any further charges with any local, state or federal agency against the Township and/or any of its employees, agents or administrators arising from dealings that have occurred up to and through the date of execution by all Parties to this Agreement (paragraph 19). Montvale will provide $10,000 for attorneys fees to the plaintiff’s law firm, Weil, Goshal & Manges LLP (paragraph 20). If the Township violates the agreement, the plaintiffs may seek an expedited and immediate injunctive relief through an order from the court (paragraph 26). As Edmund Burke once said: “The only thing necessary for the triumph of evil is for good men to do nothing.” For the past 7 months in NJ, we have seen a lot of good people saying nothing — as hatred and animosity towards the (((others))) came to the fore. When a Mahwah Council-member (he has since resigned) mocked a Holocaust survivor and pointed to the “money-trail”, the good people were silent. Racism isn’t new and hating people because they are different will never go out of style. But between the violent outbursts we learn about in civil rights battles, there was always an everyday racism. It’s the story of average, everyday people. People that didn’t seem to be expressing active hatred. People that seemed to just want to continue going about their daily lives the way they always had been. It’s the everyday attitude that lets hatred proliferate when it ceases to be the muffled noise, and moves to the streets. Eighty-four years ago, silence by good and decent people in Europe let evil triumph, as people took to the streets to advocate the destruction of the Jewish eruv and threw stones through windows of the Jewish community president’s home. I have seen similar comments of those who threaten to tear it down today. Not in Europe, but here in New Jersey. Perhaps, those that don’t learn from history ARE doomed to repeat it. What lessons are you learning? BUCHAREST, Feb. 13. — The combined efforts of all the members of the police force of Dej. Transylvania were required today to quiet disturbances which arose when the Christian population of the town protested against the execution of a Sabbath duty by the Jewish community of Dej. When the members of the Jewish community appeared in the streets carrying wire to be used in partitioning toff a part of the town for the purpose of establishing an “eyrev” for the Sabbath, the Christian population began a demonstration, inisting that the “eyrev” symbolizes Jewish possession of the township. The demonstrators marched through the streets of the Jewish quarters, breaking windows and damaging the house of the Jewish community president. Although the police of the town, which is predominantly Jewish succeeded in establishing order, excitement still continues in the atmosphere. 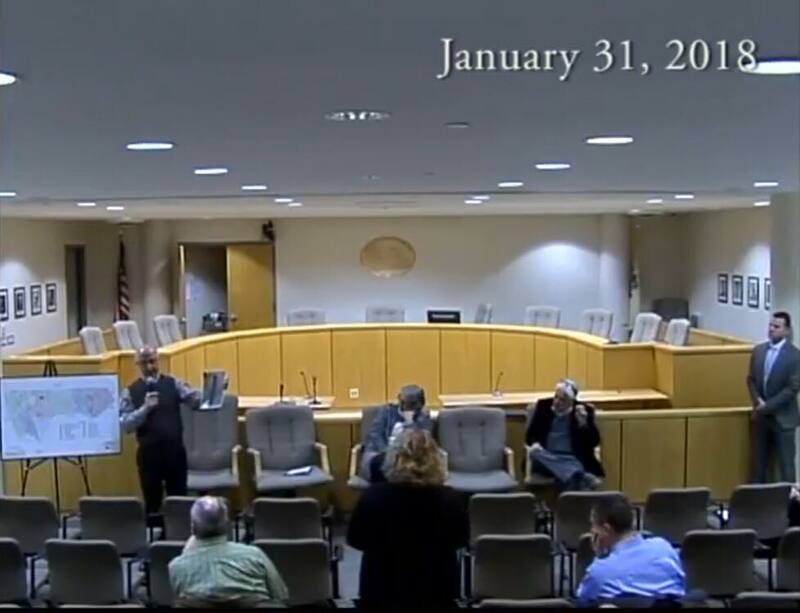 United States District Judge John Michael Vazquez gave his preliminary thoughts about various issues involved in Friedman, et al., v. Borough of Upper Saddle River, at a hearing held on January 9th. You can read our previous write-up here. Below is a synopsis of stances the parties have taken, with links to relevant sections of their briefs (where they make their respective arguments). What follows as “thoughts from Judge Vazquez” has been pulled from the the transcript of last week’s hearing. 1. Enforcement: Consistent or Selective? Thoughts from Judge Vazquez: “The town has said they’ve had a history of enforcement of the ordinance. They essentially say it’s always enforced. They have specific training for the police officers; they have officers on patrol. “The town says while the Chief did not authorize or condone them putting up the eruv, but they had just been told three days prior that they were allowed to go forward and go see the Police Chief, and indeed the Police Chief was the one in charge of enforcing the code. So at a minimum, it seems like the Police Chief wasn’t aware of the code or the ordinance that the town now says is being enforced universally by the town at that point. And in fact, it doesn’t seem that any of the town officials, who plaintiffs spoke with, were aware of the ordinance. 5. Does The Discriminatory Intent Of The Council Matter? Thoughts from Judge Vazquez: “[Defendants] also say, at best, it’s an open question at the Supreme Court level. But to the extent it’s an open question at the Supreme Court level, I look to the circuit, and Tenafly clearly says I should consider whether there’s discriminatory intent in reading the law. 6. What was the purpose of Ordinance 16-15? The reason that the Township of Tenafly lost their case, a decade ago, was because the court found, in part, they inconsistently enforced their ordinance against some, but not all items, placed on utility poles. 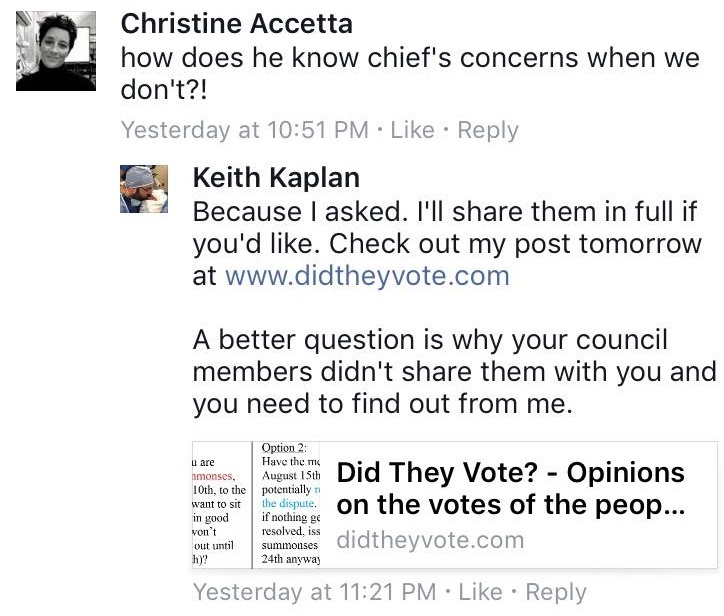 In the Upper Saddle River action, Judge Vazquez seems to make the argument, that the very fact that the Township administration approved and the police monitored, the installation of the lechis, it is evident that they a) hadn’t considered the lechis a violation of the ordinance or b) didn’t consistently enforce the ordinance. This is a situation that has been seen in Mahwah and Montvale as well. In the Mahwah eruv litigation, the Mayor issued a statement that “[a]dvice by our attorneys is that we cannot do anything about the installation of these plastic pipes on these utility poles establishing a ERUV” and “BPU and O&R are obligated to allow these ERUV markings, But they have NO OBLIGATION to notify the municipality” (emphasis in original). The plaintiffs also paid for Township police to be present at the installation of the lechis on multiple occasions (see invoices here). Both the administration and the police department, when dealing with an application for an eruv, treated it like they would any other permitted use. They didn’t know that the eruv was not permitted, which indicates that the ordinance cited was not being consistently enforced. In the Montvale eruv litigation, the Borough’s Mayor issued a statement indicating that “[a]bsent any compelling safety concerns, there is little role for Montvale to play in what amounts to a private negotiation between Orange and Rockland and the community that requested the eruv”. The plaintiffs also paid for Borough police to be present at the installation of the lechis on multiple occasions (see invoices here). Again, if the Township’s own Mayor and Police Department treated this as an appropriate and permissible application, it’s clear they didn’t know that the eruv would be banned per the ordinance cited. They cannot, now turn around and claim that the Borough has always and consistently enforced the ordinance. Montvale, as reported via the Bergen Record, has been in negotiations with the eruv association regarding a settlement. Mahwah filed for an extension to submit their response to the complaint until January 31st in contemplation of settlement. USR has postponed their Motions to Dismiss and for a Preliminary Injunction until February 7th, in contemplation of settlement. There is currently no update or change in the suit by the State of New Jersey against the Township of Mahwah and the Mahwah Council. All case documents cited can be found at the respective links. Judge John Michael Vazquez held oral argument Tuesday, in Friedman et al v. The Borough of Upper Saddle River et al. The hearing was initially supposed to cover only the motion for preliminary injunction. I wrote up the issues involved in that motion here. The Judge did touch on the motion to dismiss as well. The lawyers gave their names for the record. That was the last they spoke. The rest of the hearing, which lasted approximately half an hour was spent listening to Judge Vazquez providing attorneys for the case, with his ‘preliminary views and questions he would have’, should he decide to issue any rulings at the hearing. He also indicated that he was prepared to rule. The Judge started with a quick synopsis of the status of the case. He showed an in-depth understanding of every argument mentioned in the briefs, a strong command of the particular issues and facts asserted in the various declarations and was clearly well prepared. “Essentially, this matter focuses on the First Amendment, which has two requirements: One, that as it applies to the states through the 14th Amendment due process clause, that the Government cannot establish a religion, but at the same time the Government cannot prohibit the free exercise of religion. And as the parties have pointed out, normally when we are addressing the free exercise, the question becomes whether a Government entity can make a reasonable accommodation for religious purposes. After the brief overview, he came back to the theme of the morning: why don’t you settle this? “I begin by saying I do think this case would be ripe for some type of mediation or settlement conference. This suggestion was rebuffed after the meeting, by Counsel for USR, Bruce Rosen who stated: “We are not meeting with them. We are not sitting around a table with three… if the council decides to pursue this [settlement negotiation] we will have a separate negotiating session with them”. Mr. Rosen further stated that “there is no reason for them to be decided together”. The Judge went through the issues raised regarding license agreements between the Eruv Association and the utility companies. He cited allegations by defendants that the license agreement is invalid. He referred to comments made in the parties’ briefing regarding the number of poles, the agreements covering each of the poles, the various ownership and related endorsements. The eruv though, on the other hand, the plaintiffs, argue they are authorized by law to do so, and they point to the O & R license agreement that is still operative, and to the extent defendants point out that they need additional licenses, plaintiffs accuse them of being nit-picking and hypertechnical. I do not think it’s nit-picking and hypertechnical, because it was really the thrust of plaintiffs’ argument that they had the proper licenses. So I do not agree with that characterization by the plaintiffs. That being said, plaintiffs have now presented evidence that O & R and Verizon are going to give any necessary additional licenses to complete the eruv, so it doesn’t seem like it’s going to be a real issue in this case. The Judge did mention later that while the agreement may not currently cover all of the poles, it is sufficient to use the poles for which they currently have an agreement. Here, Judge Vazquez addressed arguments that the case wasn’t ripe. For those not familiar with the term, “ripeness” is a legal term indicating that the case is permitted to be heard by the court, at this stage. In the defendant’s motion to dismiss, defendants claimed that since no formal approval for the eruv was requested from USR, the eruv association was not yet permitted to file suit. They argued that the plaintiffs would have had to file a request, get turned down and only then, could they sue in court. “But the defendants claim that they need, that the plaintiffs need municipal consent and have never asked for it. There is a question of fact there, but when I get to the later issues it certainly seems as though the plaintiffs went to the correct people, or at least people with the apparent authority to give approval, and this was an after the fact litigation tactic by the defendants to try to slowdown this case, saying that they needed to get municipal consent. Standing refers to whether or not a particular party to a case can show a sufficient connection to the wrong alleged so that they can continue in the action. Judge Vazquez went through the standing of the individual plaintiffs. He had questions that he would raise regarding individual plaintiffs currently living within the NY eruv, but since other plaintiffs, including the BREA clearly have standing, it wasn’t an issue on which he felt the need to dwell. When discussing plaintiff’s argument that the USR ordinance is unconstitutionally vague (to the point a party wouldn’t be able to tell what it legally covers), Judge Vazquez took issue with the term “matter”. The Judge said he didn’t have enough information to determine whether or not it was vague enough to be unconstitutional. Since there were no definitions provided for “matter” and the parties didn’t provide dictionary definitions, he said he would need additional information to support those arguments. Next, Judge Vazquez discussed the requirement Upper Saddle River says exists on the State level, in a statute that requires municipal consent when using poles that belong to another. He also questioned whether or not the preceding statute, 43:3-18 needs to be read in conjunction with it, which would change the meaning, as plaintiffs argue in their briefs. The federal courts use different levels of review to determine how to answer questions. Here, that has to do with how badly a municipality can violate your rights before the court is allowed to tell them to stop. Core constitutional protections have a much higher bar to get over than statutory ones. The level of review to be used by the court is a crucial determination as to how difficult it would be to enforce the statutes in question against an eruv. Judge Vazquez also questioned if a determination that the ordinance was “facially neutral and generally applicable”, was good enough, due to the findings in the Tenafly action which looked at the “effects of the statute”. Despite claims by the defendants that discriminatory intent in the drafting of facially neutral, generally applicable ordinances is irrelevant, the Judge stated that he’s not going there. The judge said that he looked at the Town ordinance history and said he thinks “the plaintiffs have raised real concerns about a discriminatory intent in invoking this law, and that the effect was to only harm the plaintiffs.” He said it was an open question as to whether that rose to “a possibility of success or a probability of success”, but wanted to give the parties the benefit of his thoughts. Judge Vazquez went through the history of the claims surrounding the reasons for the ordinance. He spoke about the claims defendant offered regarding political signage. He noted that there was no evidence proffered by the defendants of concern, at the time, over political signage and that the only evidence appeared in the form of after-the-fact certifications that problems existed, in the past. He questioned why this was an issue that needed redress with a new ordinance, since the town already had a sign ordinance that dealt with the “major concern”. He spoke about how the ordinance followed almost immediately, after a closed session meeting in which the eruv was discussed. He distinguished the present case from the Tenafly case because in Tenafly, the town had a long-standing ordinance as opposed to the present situation where a new law was enacted once an application for an eruv surfaced. He seemed to question why an ordinance dealing with signage needed to be amended again… in order to deal with problematic… signage. He also stated that he didn’t see any issue the town was having with devices, but now the ordinance was being amended to add the term “device”, which he noted the town is using in connection to an eruv. The Judge referenced a 2015 request from O&R regarding signage sent to the Township, questioning whether the new law was even effective at solving the stated objective that the old AND new law were already capable of handling. Judge Vazquez also noted that “it’s not lost on the court” that the same group that complained on multiple occasions about signage was the organization that drafted an agreement with the Vaad HaEruv, and that to the extent O&R did have problems with signs on poles, they clearly didn’t see the eruv as being in the same category. The Judge noted that USR has claimed the ordinance in question has always been consistently enforced, that they have training for police officers and that they have officers on patrol. Then he questioned the violations for which the town was not aware, until plaintiffs pointed them out in their filings. Since some of the items were permanent, like mailboxes, the judge said the court has concerns about the claim that USR was always enforcing this ordinance. He questioned how they could have been there for so long if the town did have training and had police officers on patrol. After a tick-tock of the various meetings and conferences between the plaintiffs, the police, code and enforcement officials and the Town’s representatives, the Judge noted that they were given a meeting with the USR police department who were responsible for enforcing the ordinance. Judge Vazquez questioned the position of USR that the eruv could proceed “temporarily” because a) there was no indication that the eruv would be a temporary structure and b) it seemed as if the eruv was being considered by the Borough — a claim they say never occurred. He went into detail on the meeting held with an Upper Saddle River code official, a property maintenance officer and Town officials (including the Town’s administrator). He indicated that plaintiffs did exactly as they were told at the meeting and went to see the police department, who were in charge of enforcing the code. The judge noted that after meeting with the police chief, the town claims that the police chief didn’t authorize or condone the eruv, but Judge Vazquez questioned the actions that took place. “They had just been told three days prior that they were allowed to go forward and go see the Police Chief, and indeed the Police Chief was the one in charge of enforcing the code. So at a minimum, it seems like the Police Chief wasn’t aware of the code or the ordinance that the town now says is being enforced universally by the town at that point. And in fact, it doesn’t seem that any of the town officials, who plaintiffs spoke with, were aware of the ordinance. The judge also questioned the timing of reminders to officers on how to enforce the ordinance, that came directly on the heels of the request for the eruv. He wondered why such reminders would have been necessary had the township truly been enforcing the ordinance, in a neutral and generally applicable matter for years. The Judge finished by stating the he believed that the final issue was going to be whether the plaintiffs show a possible or a probable success at proving the requirements for a preliminary injunction. He strongly recommended and encouraged the parties to talk to their clients and decide if it would be fruitful to see if a resolution can be reached. Judge Vazquez did say that once he received answers to the questions he posed throughout the hearing, he would be able to reach a decision. But it was his hope, that the parties could come to a resolution, especially one that involved the other towns. The parties met in private and came back on multiple occasions. At several points, before, during and after the hearing, the various counsel met with their clients and each other. UPDATE: A stipulation was filed with the court today at 1:37pm extending the deadline for Montvale to respond to the complete through January 31st. As was reported by NorthJersey.com, Montvale, NJ is seeking to settle a federal lawsuit filed by Orthodox Jews in Rockland County, NY over discriminatory ordinances that were created in the weeks after a request for an eruv was initiated in the borough. Eruv Litigation will continue to monitor the court actions and post documents for the public. The response to the complaint in Montvale’s Federal Court case is due today. The suit against Montvale was filed on October 18th of this year after attempts by the Plaintiffs lawfirm to settle the issue were unsuccessful. The plaintiffs also have suits pending against Upper Saddle River and Mahwah, NJ. The case in Upper Saddle River is set for Oral Argument in NJ Federal Court on Jan. 9th before Judge Vazquez. In Mahwah, NJ this evening, the Council agenda lists the second and final reading of Ordinance 1820, which will roll back the ban on non-residents using local parks put in place this summer after some residents demanded action against overcrowding in parks by Hasidic Jews. This website is not affiliated with any parties in any pending litigation. Information is provided as a service to the respective communities and no warranty is made as to accuracy or timeliness of the information. Nothing on the site constitutes legal advice.